xbox 360 games bundle used. Condition is Very Good. Shipped with USPS First Class Package. Condition is Very Good. Halo Wars -. Halo 3 ODST -. Mortal Kombat vs DC Universe -. Dead Space -. Dead Space 2 -. Dead Space 3 -. Left for Dead 2 -. Condition is Good. Nascar Inside Line. Bundle comes with Grand Theft Auto 4 Grand theft auto 5 L.A. Noir Farcry Compilation (FC 2, FC 3, FC Blooddragon) Fable 2 xbox 360 games bundle used. Condition is Good. Shipped with USPS First Class Package. Used Xbox games. In original case. Halo 4 ( Two Disk and Case). -- Borderlands 2 ( Disk, Case ). Grand Theft Auto IV and The Elder Scrolls V: Skyrim. Xbox 360 Games Bundle. Shipped with USPS First Class Package. Used in god order. Condition is Good. Halo Reach. Call of Duty 4: Modern Warfare. Call of Duty: Modern Warfare 2. Call Of Duty XBOX 360 Games Bundle Lot. Condition is Good. Shipped with USPS Media Mail. Games are used and work fine they have some signs of normal wear Gears of War Xbox 360 collection for sale. All games, cases and discs are in good and working condition. Gears of War Gears of War 2 Gears of War 3 Gears of War Judgment Message me with any questions! xbox 360 games bundle used. Condition is Good. Shipped with USPS First Class Package. xbox 360 games Bundle. Condition is Very Good. Shipped with USPS First Class Package. Microsoft Xbox 360 (Xbox 360). Call of Duty 3. Call of Duty World at War. Call of Duty 4 Modern Warfare. Call of Duty Modern Warfare 2. Call of Duty Modern Warfare 3. 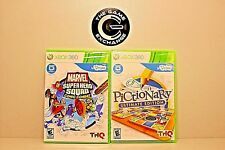 Xbox 360 games bundle including kinect game! Xbox 360 games bundle used. Condition is Very Good. BATTLEFIELD 3. CALL OF DUTY ADVANCED WARFARE. GHOST RECON. Double bundle is ideal for you and a friend to play together. Available for the X360 systems. Available for the XBox 360 system. Fringe, two brothers are torn apart after the death of their father at the hands of a grizzly bear. Crysis 2, Dead Space 2, Dead Space 3, Fallout 3. Xbox 360 games bundle. Condition is Very Good. Shipped with USPS Priority Mail. Xbox 360 games Bundle, Kinect Adventures! Just Dance, Kinectimals, Guitar Hero. Condition is Good. Available for the X360 systems. Fringe, two brothers are torn apart after the death of their father at the hands of a grizzly bear. Ten years later, the estranged brothers reunite for the hunt of their lives. See pics for titles. for XBOX 360 not sure if these will work on XB1 do your own research. xbox 360 games bundle. Condition is Like New. Shipped with USPS Priority Mail Medium Flat Rate Box. Xbox 360 Game Bundle. Condition is Very Good. Shipped with USPS Media Mail. Microsoft Xbox 360 video game bundle. Bundle includes 6 games. Everything in bundle is used and shows normal wear. Everything has been tested and works. Free USPS priority shipping. ***GAMES INCLUDED*** Assassin‘s Creed 3 Assassin’s Creed Brotherhood Mass Effect 3 (missing manual) Mass Effect Project Gotham Racing 3 Rainbow 6: Vegas 2 (disc only) TV and console are not included. Only used to show games work. Call of Duty: Modern Warfare 2 and Modern Warfare 3 Bundle Xbox 360 Used Games. Condition is Very Good. Shipped with USPS First Class Package. Video Games Bundle Ps3/Xbox 360. Condition is Like New. Shipped with USPS Parcel Select Ground. Halo xbox 360 games bundle used. Condition is Very Good. Shipped with USPS First Class Package. Discs have been professionally cleaned, tested, works great. Guitar Hero Live Bundle (Microsoft Xbox 360, 2015). Condition is Brand New. Shipped with USPS Priority Mail. They are also compatible with the Xbox 360 and Xbox ONE! Star Wars Knights of the Old Republic II: The Sith Lords. Star Wars Knights of the Old Republic. Next morning if after 5pm. Lot of 6 Xbox 360 KINECT GAMES - RABBIDS, KINECT SPORTS, NAT GEO, AND MORE! !